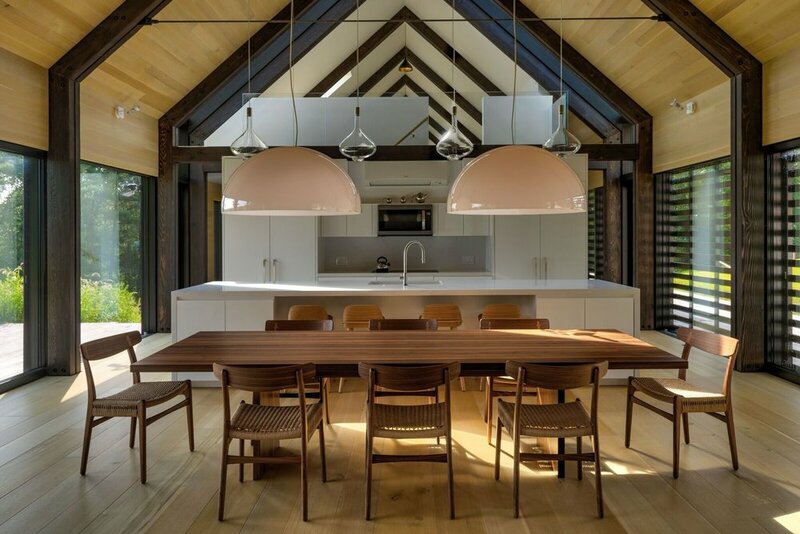 Silvernails is a family residence that celebrates the ever-changing seasonal landscape, designed to exploit natural light throughout with a minimalist, contemporary aesthetic taken from traditional barns that dot the area. 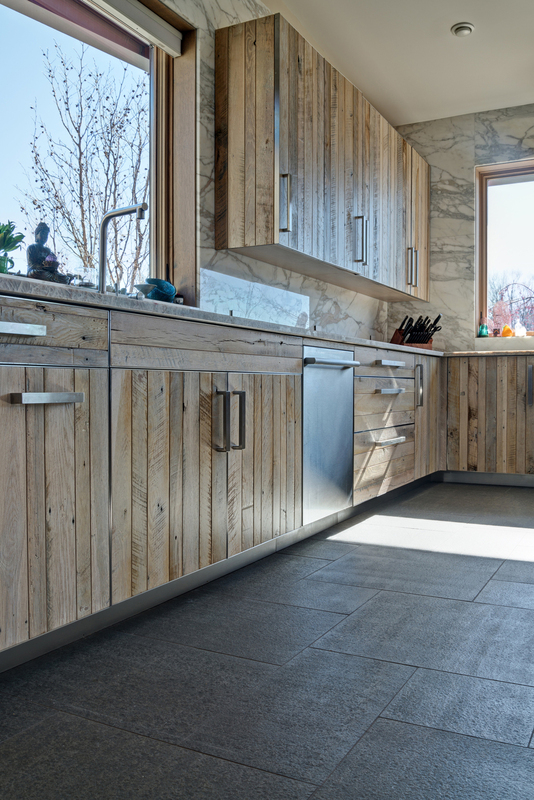 A new-meets-traditional combination that is described as "modern vernacular.” The design is based on old barns but is built with cutting edge materials. Modern technology, engineering, construction techniques and energy efficiency were employed to achieve the quality, comfort, clean-lines and openness of modern living with airy rooms and ceilings with exposed timber beams. 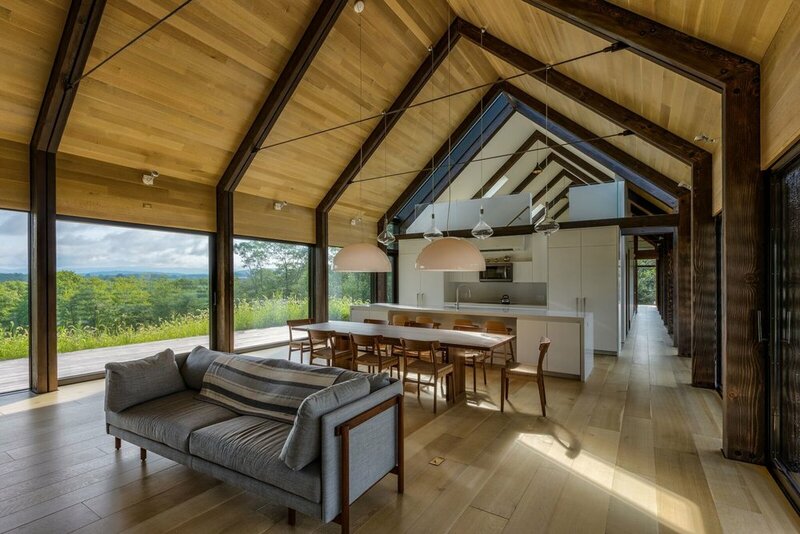 The Interior finishes were influenced by the rural setting and indigenous woods found on the property. 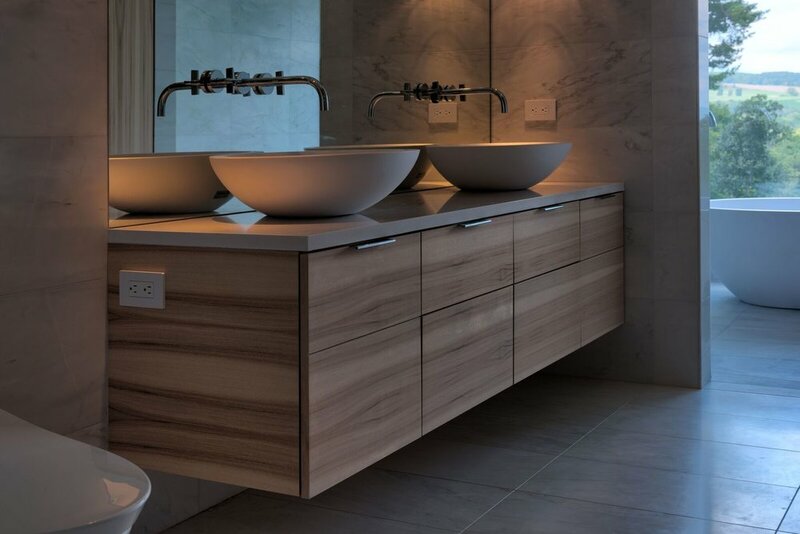 White oak was chosen for flooring, walnut for cabinetry and hickory for the feature vanity units. 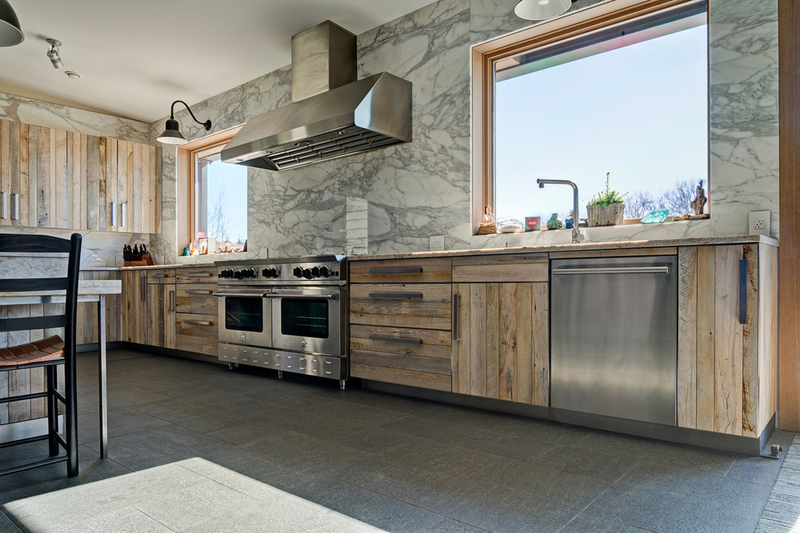 Local stone, including granite and slate, was used for the hearth, wet areas and basement walls. Completed in 2018 this modern new home was inspired by the elegant simplicity of Scandinavian summer houses. The interior is sleek and uncluttered and all about comfort, style and amenities. 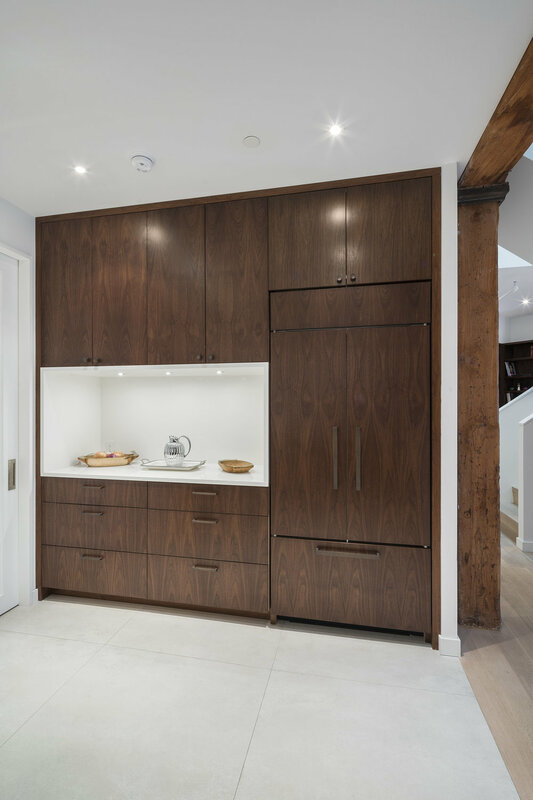 Rowan constructed the kitchen cabinetry as a minimalist’s dream, with appliances disappearing behind integrated custom panels. 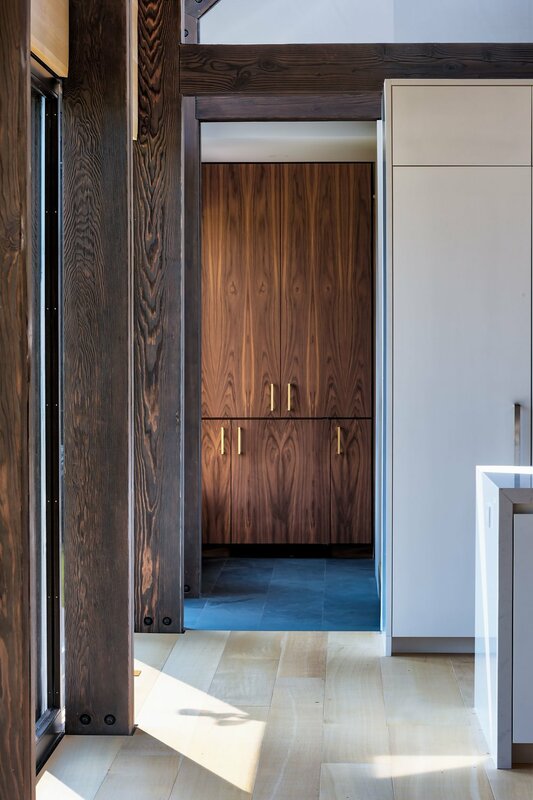 The door to a writer’s retreat disappears amongst a wall of custom cabinetry allowing it all to appear as a single entity. 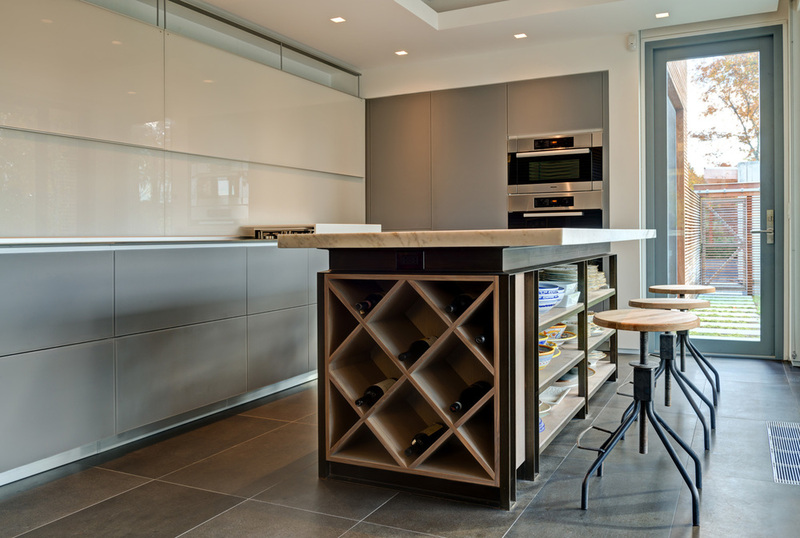 The island and table flow together unobstructed while providing a large space for working and entertaining. 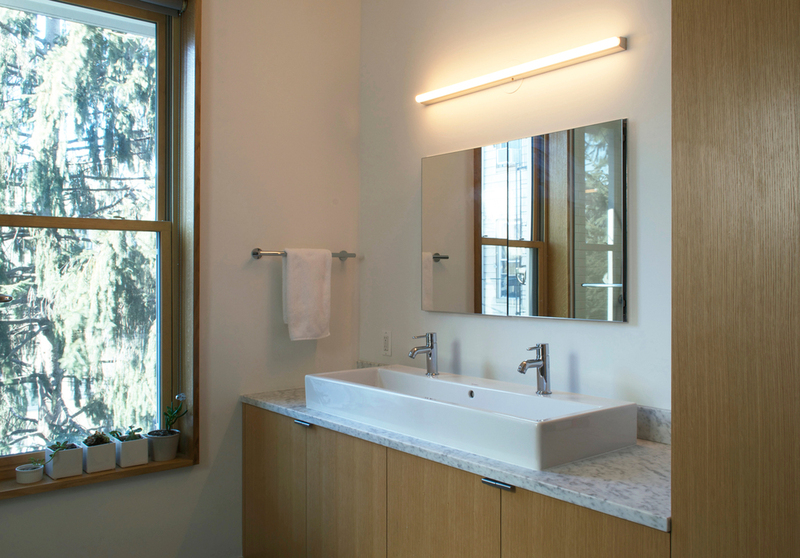 The simplicity of design is carried into the bathrooms where the vanities are sleek and unobtrusive. And in two of the bedrooms sleeping lofts are reached by ship’s ladders which are an integral part of the room’s design while also remaining utilitarian. 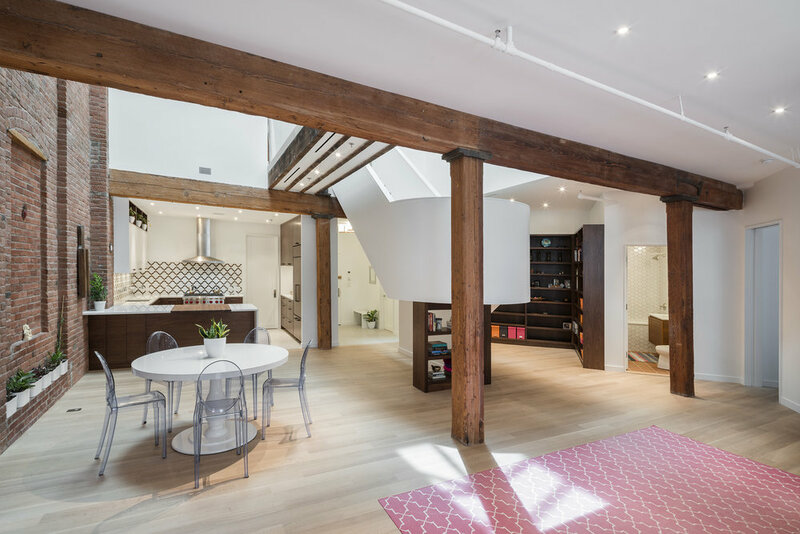 This renovation combined two adjacent duplex apartments in a TriBeCa loft building retaining the original early industrial character of exposed wood columns, beams, and masonry. The lower level includes open spaces for living, dining and eating, and enclosed spaces for utilities and studying. 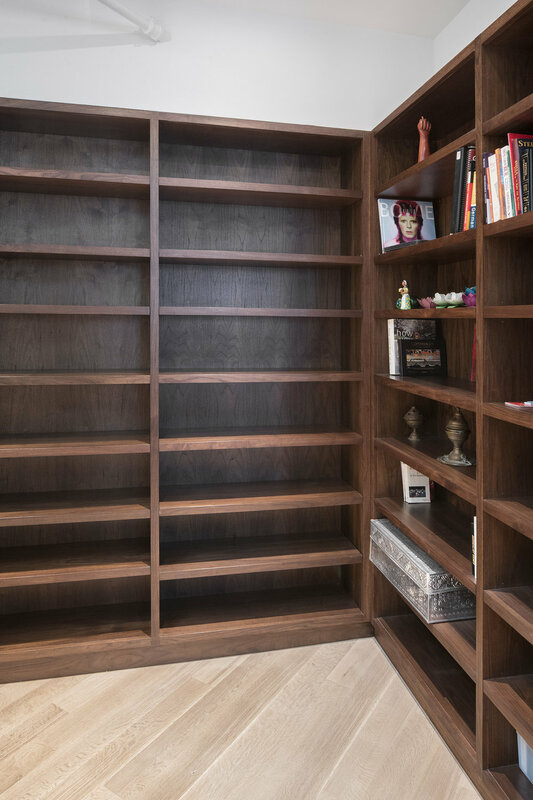 In keeping with an open floor plan and connecting spaces through the use of materials Rowan built the new kitchen cabinets, open shelving under the staircase and library bookshelves using walnut to tie the space together. 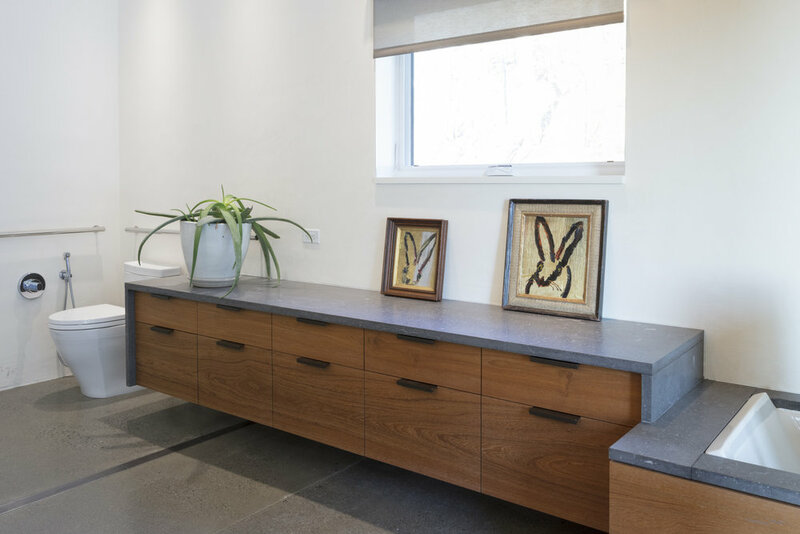 Rowan’s part in this renovation also included a rift oak bathroom vanity finished in grey wash and an upholstered painted bench. Overall, the space maintains the integrity of the original building design while bringing forward the modern sense of style. 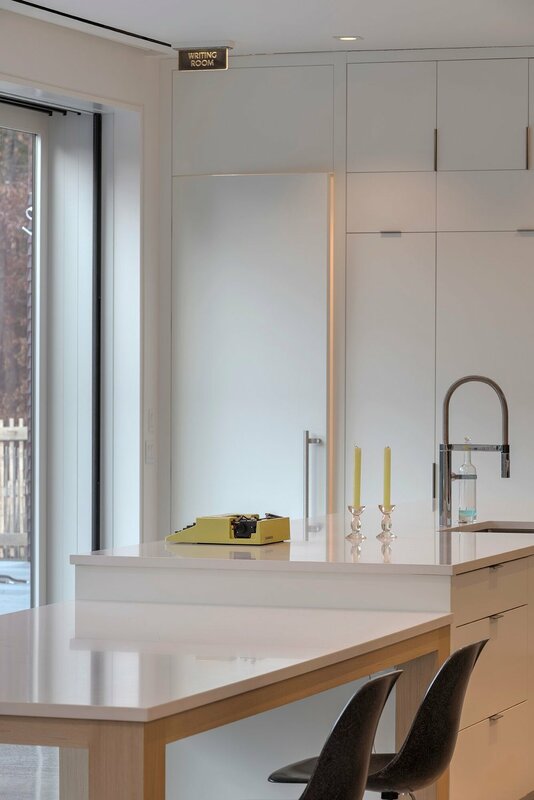 What fun to work on this passive house project guided by Universal Design principles as a fully accessible home. 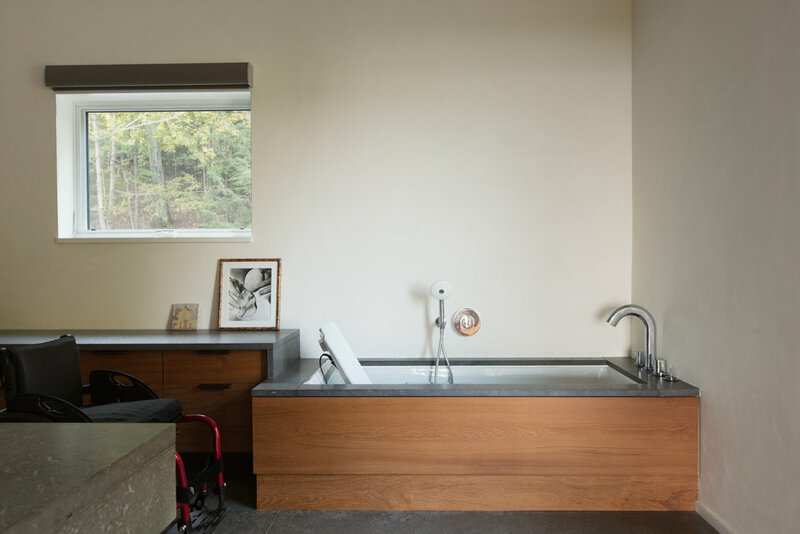 The client’s need for a home that would accommodate her wheelchair as well as be energy efficient, unique, beautiful, and functional all added to the enjoyment Rowan had being the one entrusted to fulfill all these wishes. The house was designed with an open floor plan and large windows that allow the expanse of view to become a feature of the home. 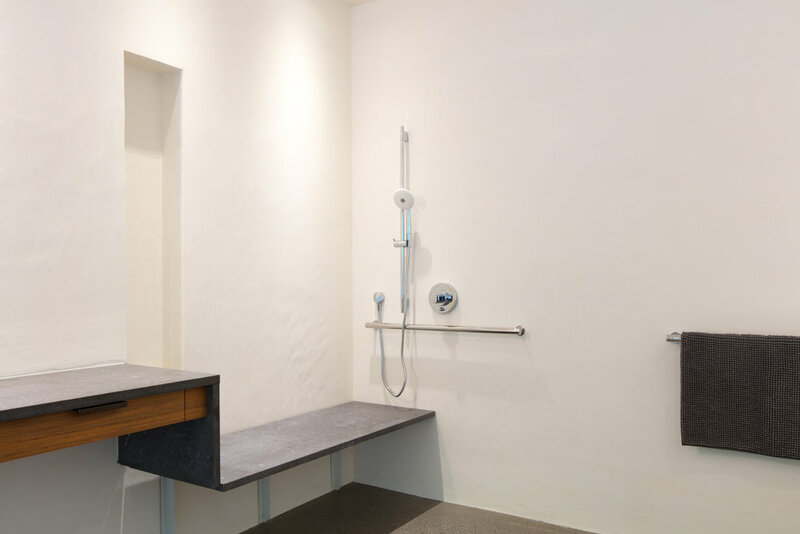 Using the idea of melding the outside with the inside materials were chosen for their durability and naturalness.The design of cabinetry, closets, vanities, and mudroom was driven by the ease of use, and the need to have spaces and units that would easily accommodate someone who uses a wheelchair - ie. 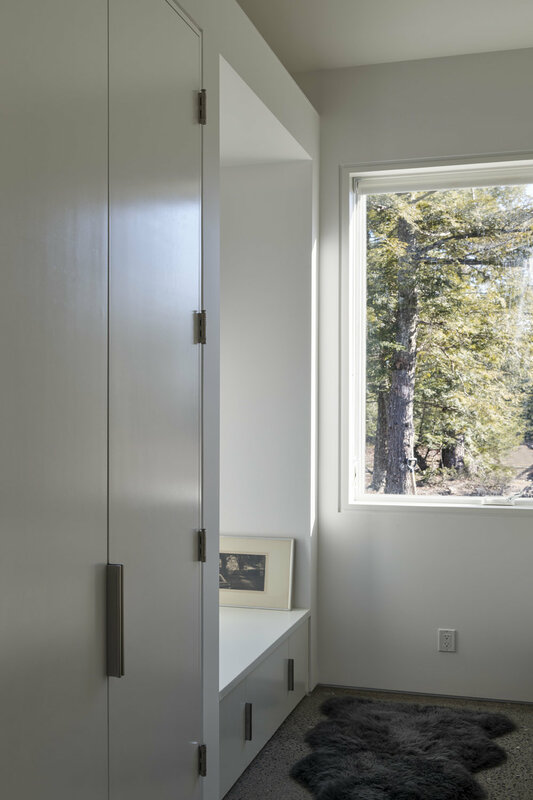 more drawers , cabinets with sliding doors that hung off the walls and were reinforced with steel brackets, roll-in showers and closets and shelving hung at heights accessible to someone seated as opposed to standing. 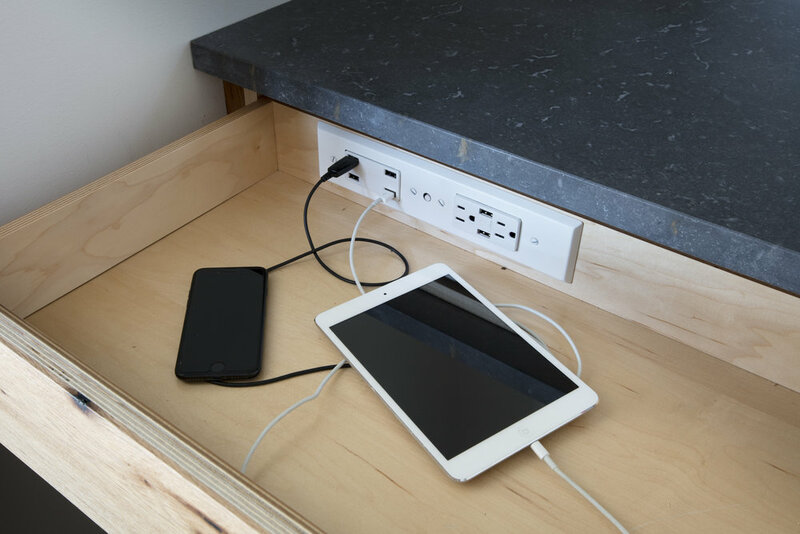 All building and design had to be worked thoughtfully and with the owner in mind. The use of teak in the bathrooms and closet was driven by it’s durability and the owner’s love of water and sailing. 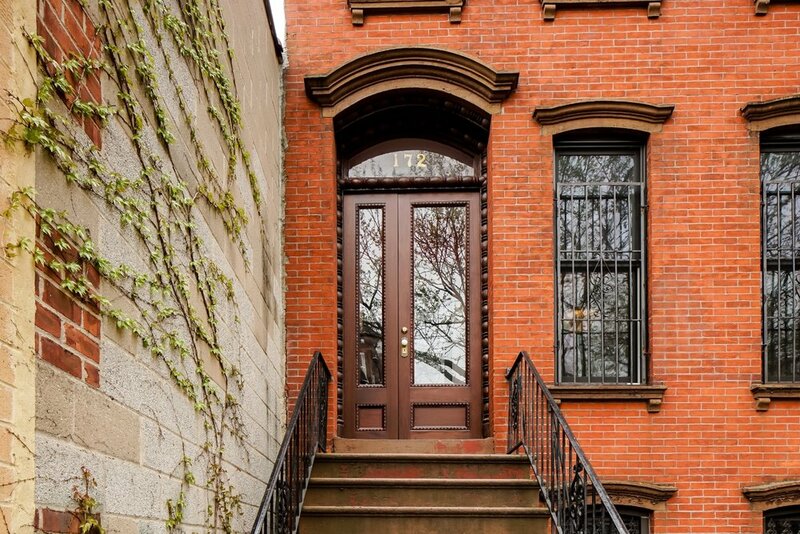 This classic Brooklyn townhouse was a single story renovation for a young family of 3. You see part of Rowan’s contribution when you come upon the front doors. 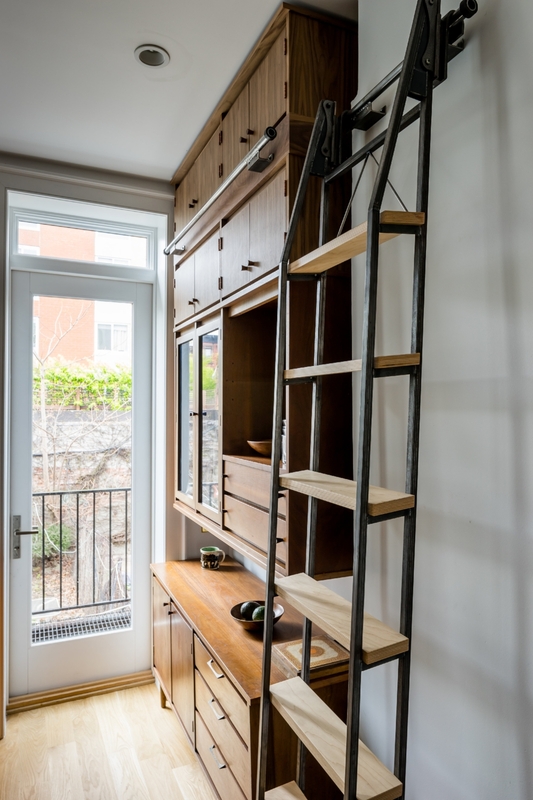 These were reconstructed by Rowan using existing and recycled doors that the client found in a salvage yard, maintaining the original design of that period. This was to be the tone set by the client- the use of old favorite pieces as the jumping off point for the design of the new. 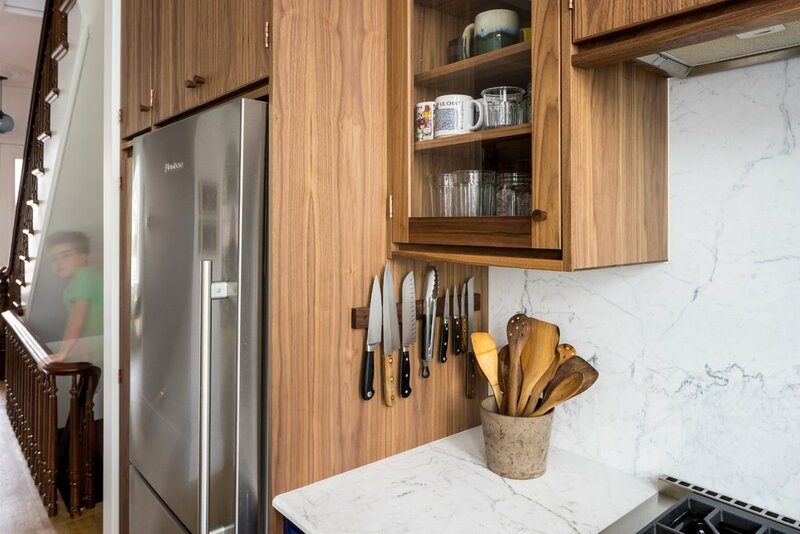 An existing hutch in the kitchen was used to integrate the new custom-built walnut and painted kitchen cabinets repeating some design elements of the original piece while making the space look fresh and modern. 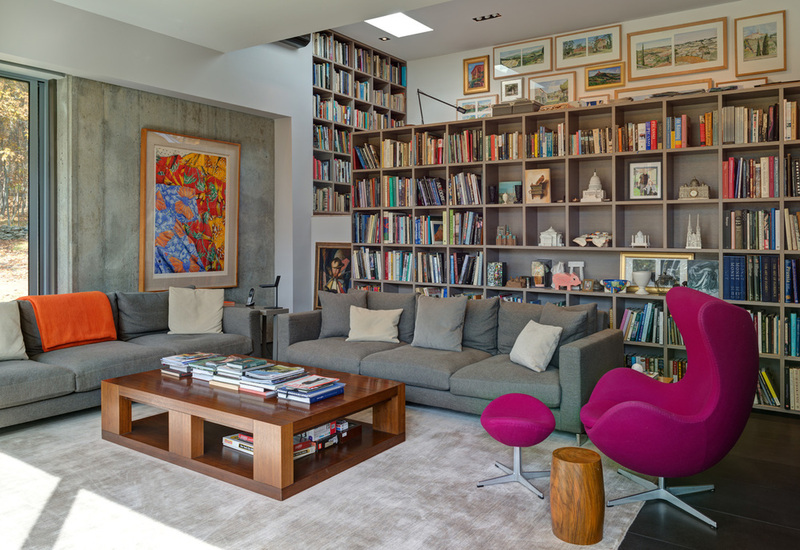 A 30 foot shelving unit was also designed around a much loved antique piece with spaces created to house the client’s artwork, media, record collection, and other favorite items. 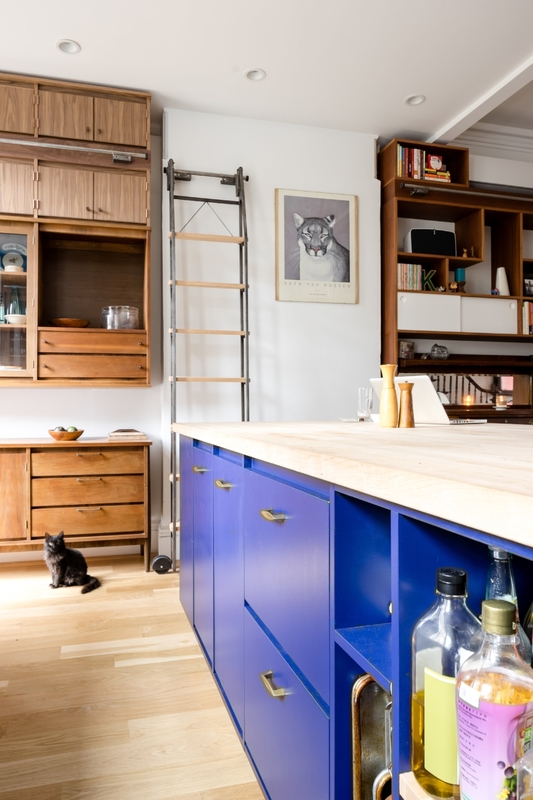 It is made out of mahogany and shares a custom - fabricated rolling library ladder with the kitchen. Rowan’s sensitivity to the clients’ wish to blend the new with the old results in a beautiful modern space that incorporates pieces from another era in an easy and seamless way that is very user friendly for the family. 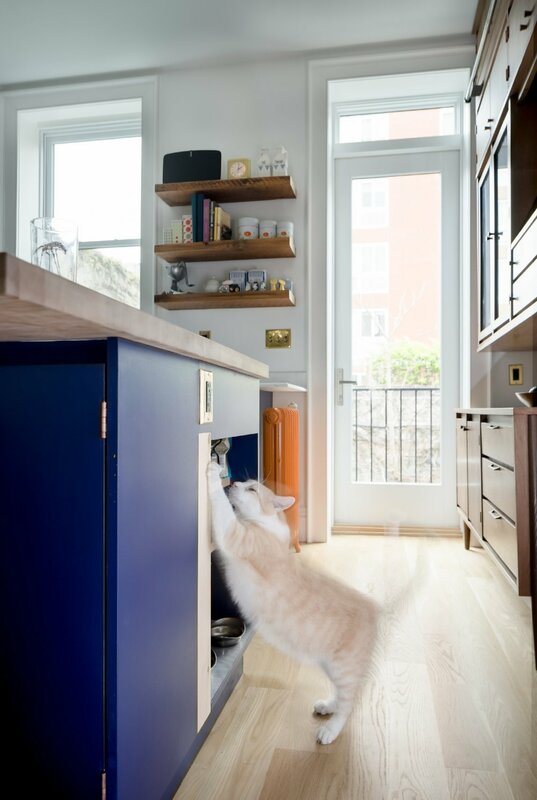 Even the cats weren’t forgotten in the design of the painted kitchen island with butcher block countertop where a custom-built nook with scratching post houses these much loved pets. 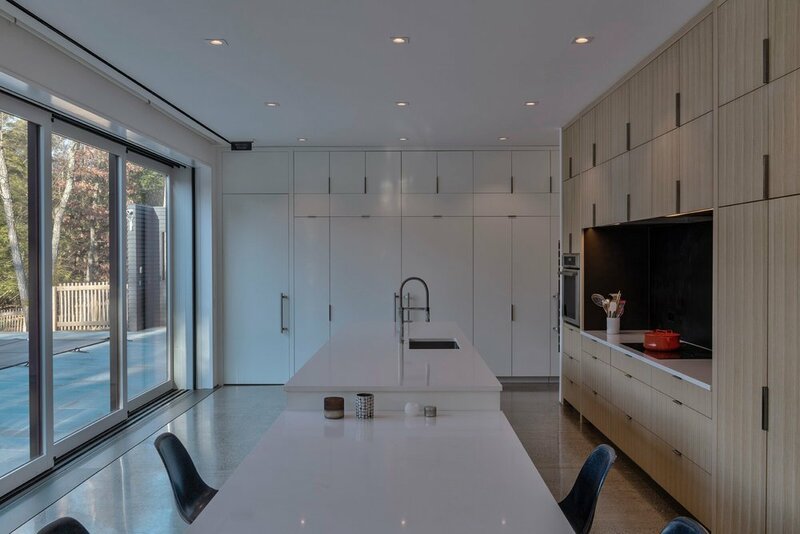 This project included both the addition of a new modern wing and the renovation of the existing structure overlooking the Hudson River. 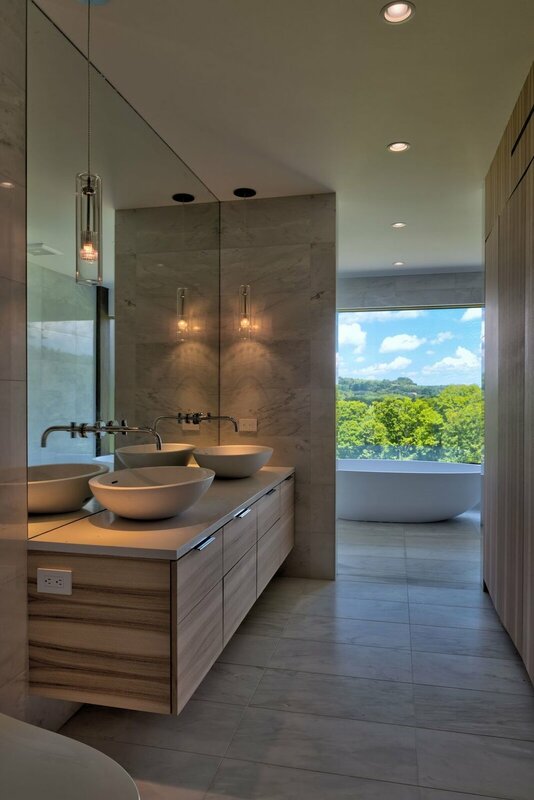 The interior of the home is done in a very minimalist style so as to not compete with the majestic views that add to this home’s uniqueness. Working collaboratively with the builder Rowan helped to integrate the new with the old making the space clean and modern for the artist owner. 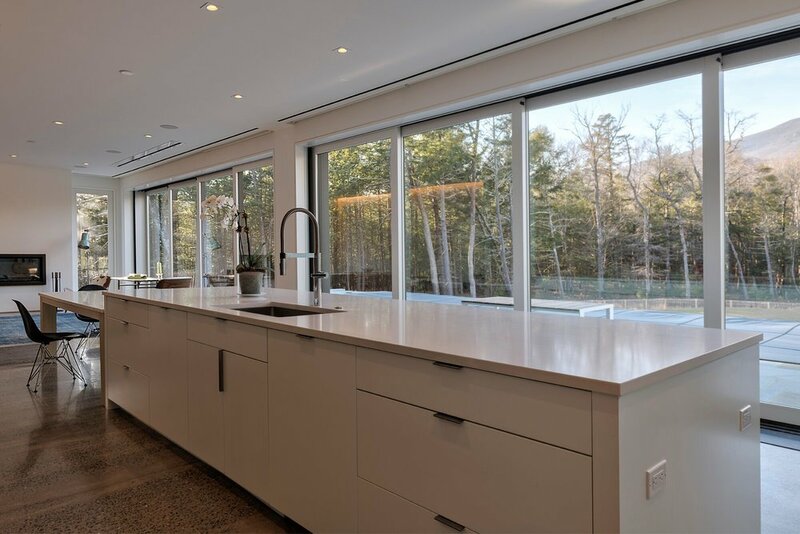 Stainless steel kitchen cabinetry, oak library, mudroom, master bathroom and studio desks were all part of Rowan’s scope and fit the client’s idea of a living/working space that is functional, beautiful and does not distract from the natural beauty of the location. This house is a year round residence set on the crest of a hill bounded by ancient stonewalls on all sides. The property is 9.7 acres and the wonderful views of the surrounding fields and stonewalls are only fully realized upon entering the house. The interior space of the house flows outdoors through a terrace off the kitchen, an alley of apple trees off of the master bedroom and a fenced flower and vegetable garden also off the master bedroom. The house is a hybrid structure constructed of a wood and steel frame sitting on a concrete base. 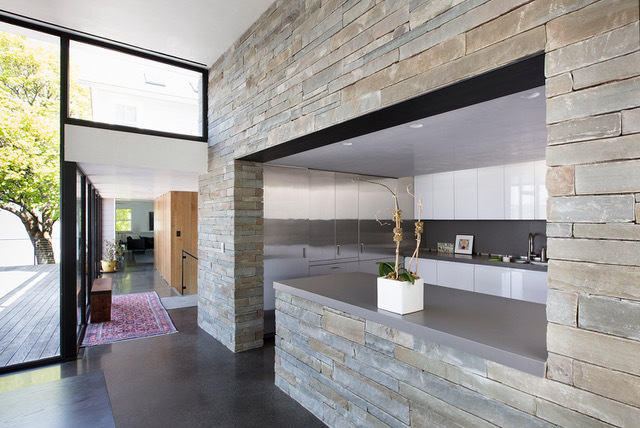 Windows and doors set through the masonry isolate independent views of the landscape. 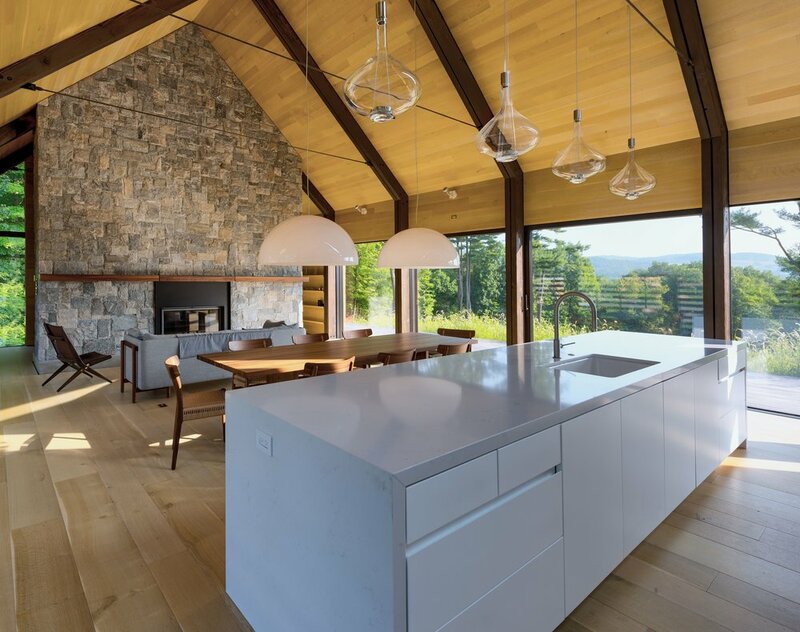 The interior walls are treated as free elements within this masonry and steel shell and sit on a stone floor that is radiant-heated. 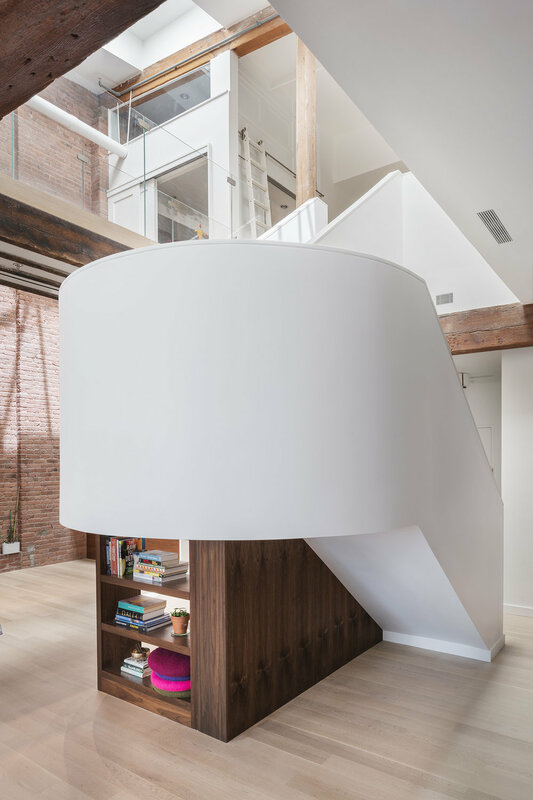 The second floor is a floating tube that is shaped in a trapezoid shape and sits on the rectangular shapes of the living area and master bedroom area. 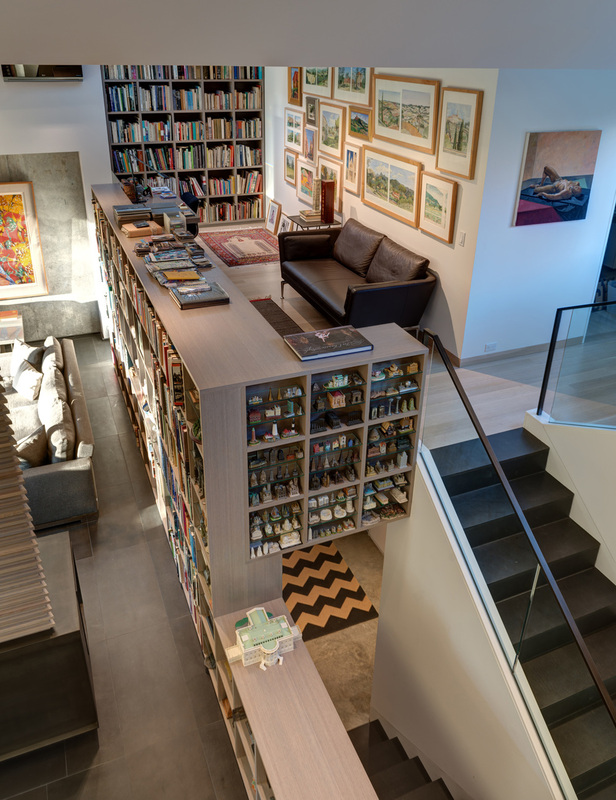 Rowan created the rift oak multi-story library that runs the length of the main room and mezzanine. This was a challenging engineering feat that serves as the showpiece of the space. An oak wrapped mantle above the unique steel firebox was created to mimic the trapezoid of the second floor and adds to the drama. Rowan also created the walnut master bedroom dressing table and window casing as well as the master bath vanity. All were done with an eye for keeping the function of the space in mind. 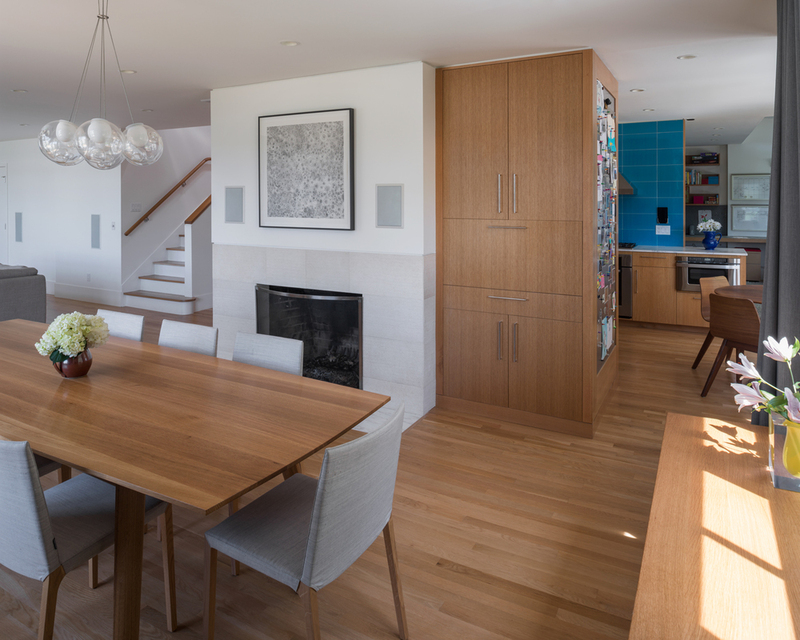 This single family home in the Riverdale neighborhood of the Bronx was fully reorganized to meet the contemporary needs of a family with small children. 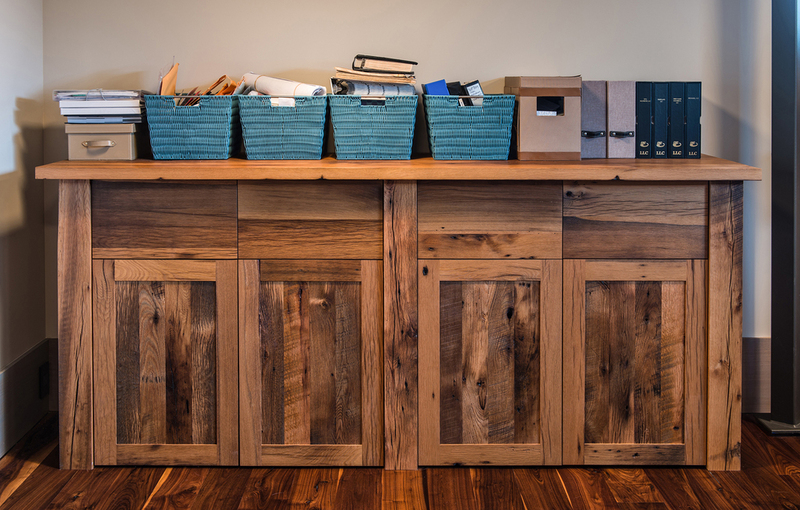 Rowan created beautiful practical storage by the new rear entry that leads into the completely custom rift white oak kitchen. A custom daybed/toy storage, book shelves and loft area in the childrens’ bedrooms were designed to meet the needs of growing children. 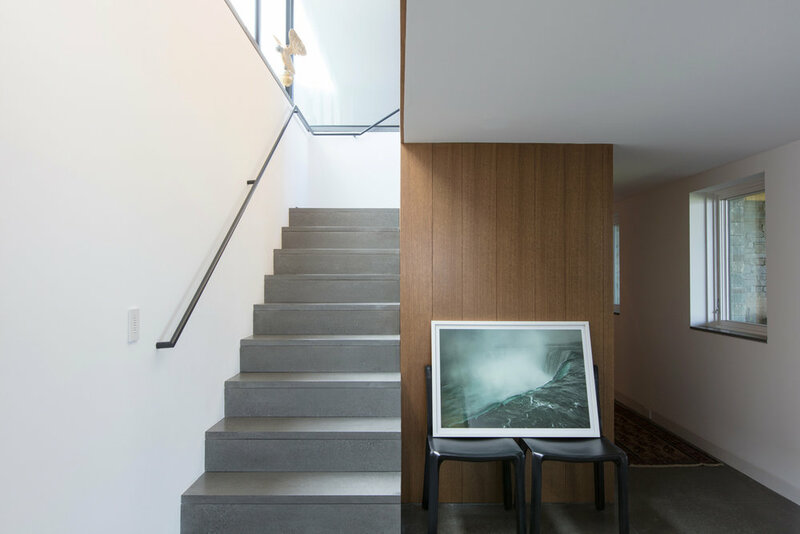 Throughout the project Rowan worked closely with the architect to make these elements work seamlessly with the other aspects of the home. 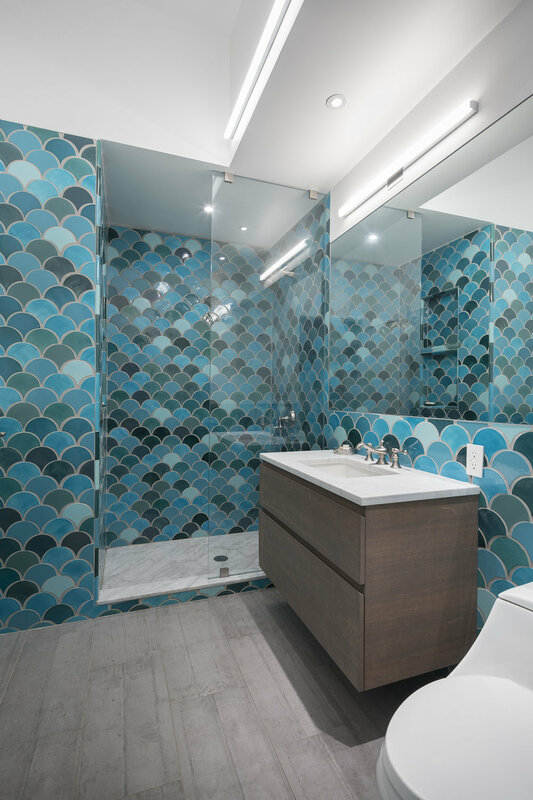 This project consisted of the conversion of a 3-family, wood-frame townhouse into a 2-family occupancy. 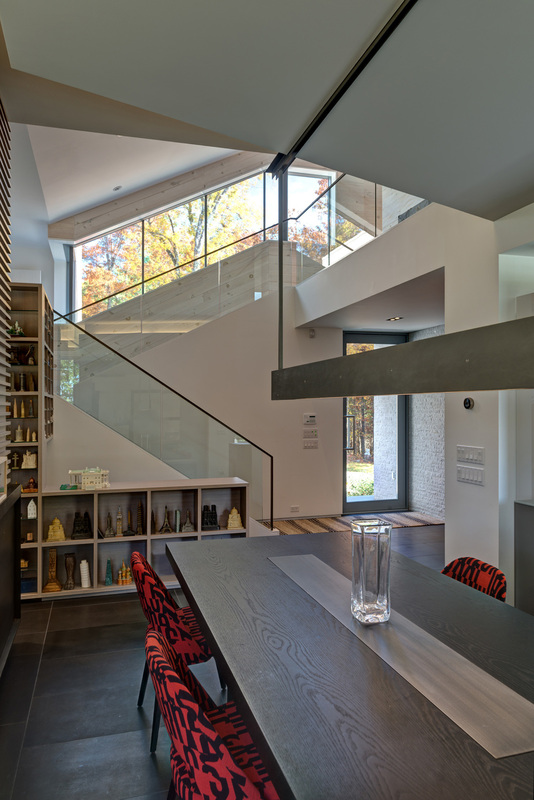 The centerpiece of the project is a double-height stair hall featuring a bridge that connects the two upper-level bedrooms. Natural light is pulled deep into the center of the building down to the 1st floor through the use of an existing vestigial light shaft. 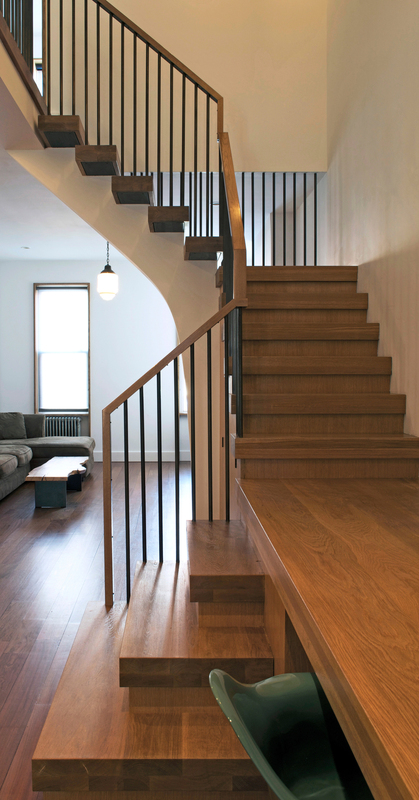 Rowan fabricated all of the white oak stair treads including a landing that also serves as a writing desk with storage above. 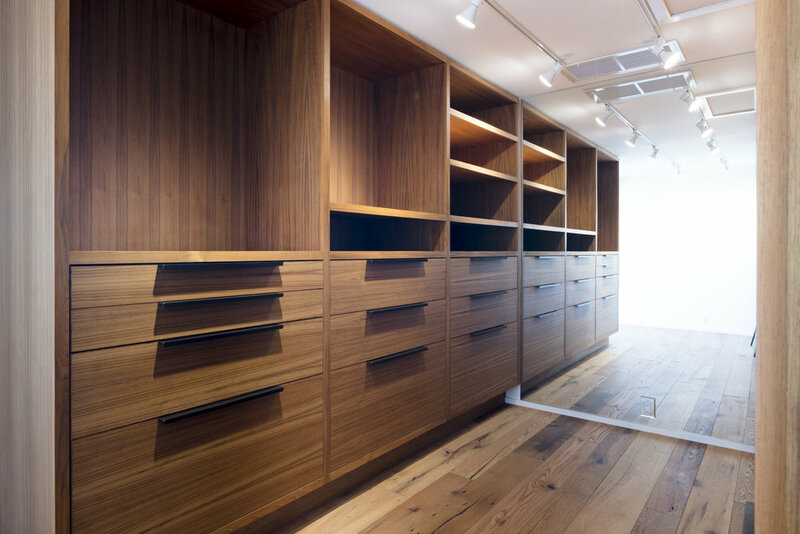 More storage in the form of a custom build cabinet, book shelves and bathroom vanity were also part of Rowan’s work scope for this modern townhouse conversion. 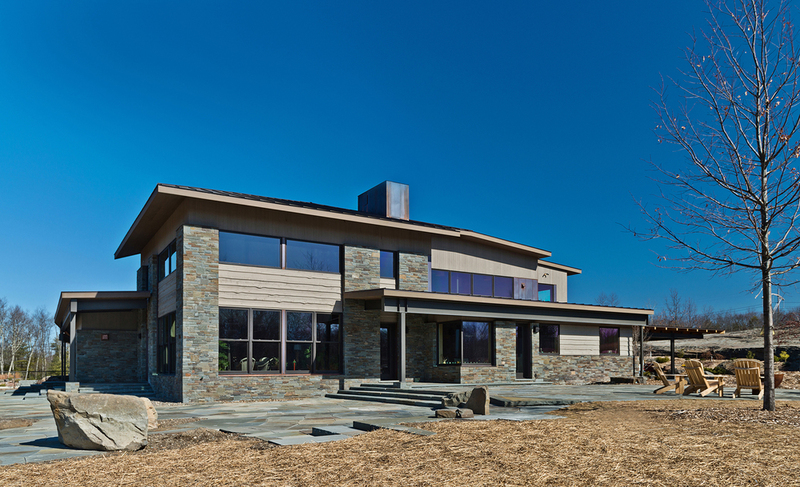 This high performance home was built to 'Passive House Project Standards'. It is situated on an old blue-stone quarry nestled in the picturesque Catskill Mountain's. 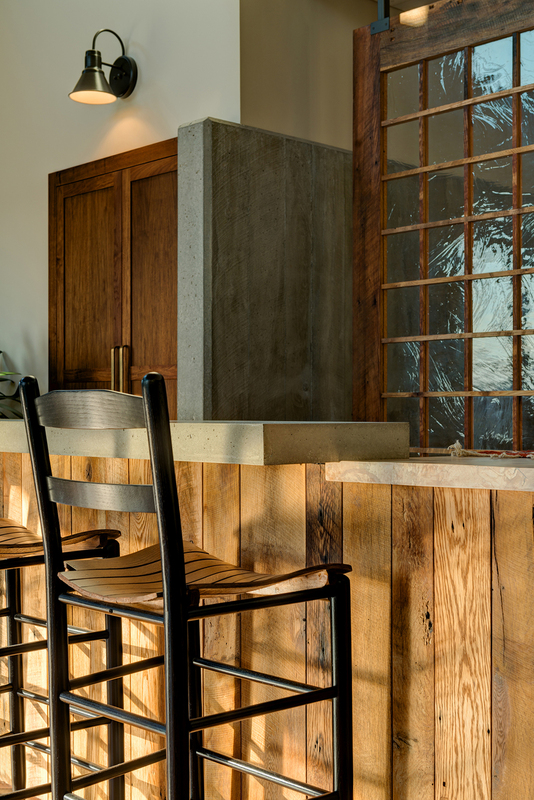 The main roof support column was salvaged from the quarry site and along with the bar and privacy screen that Rowan crafted out of reclaimed oak it serves as the focal point of the grand room. 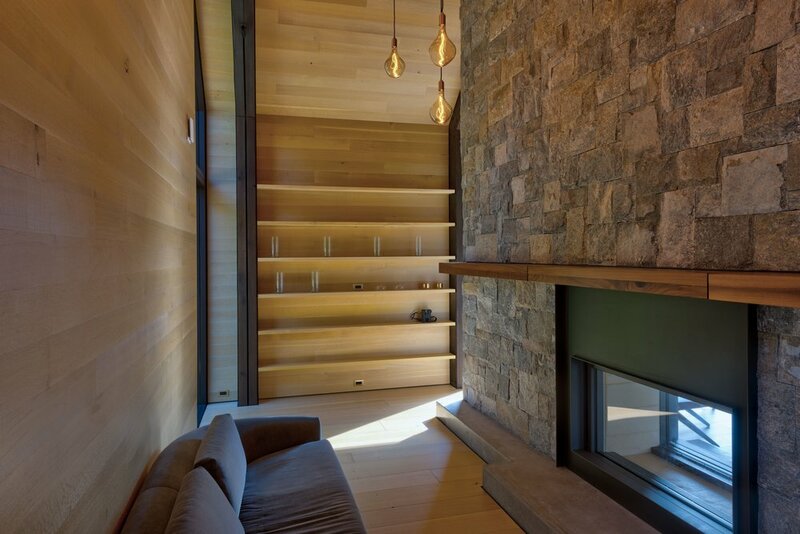 The walls and ceilings are all recycled wood as are many of the custom cabinetry elements in this 'one of a kind' home. From the reclaimed oak barn-style doors to the master bed with its dramatic piece of reclaimed spalted maple as the headboard Rowan succeeding in fulfilling the homeowners’ goal of reusing and recycling found materials. The kitchen is definitely central to this theme. 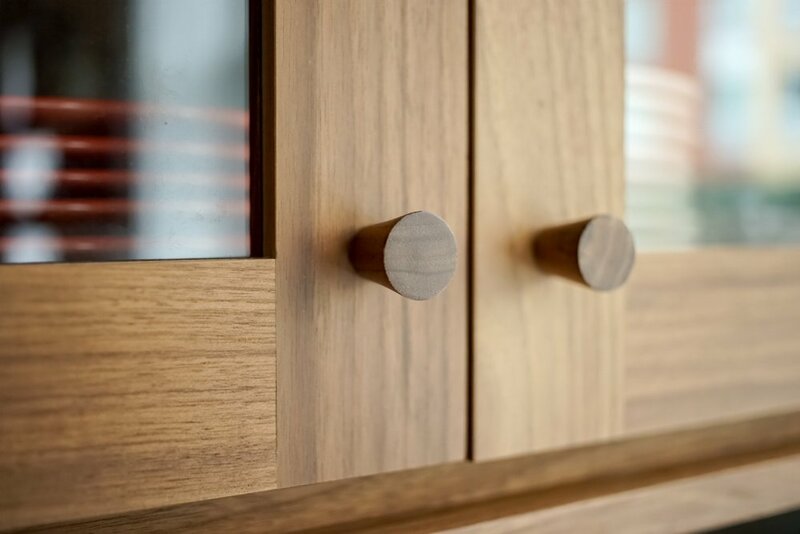 Rowan built all the doors and drawer fronts out of reclaimed oak fitted into stainless steel frames. 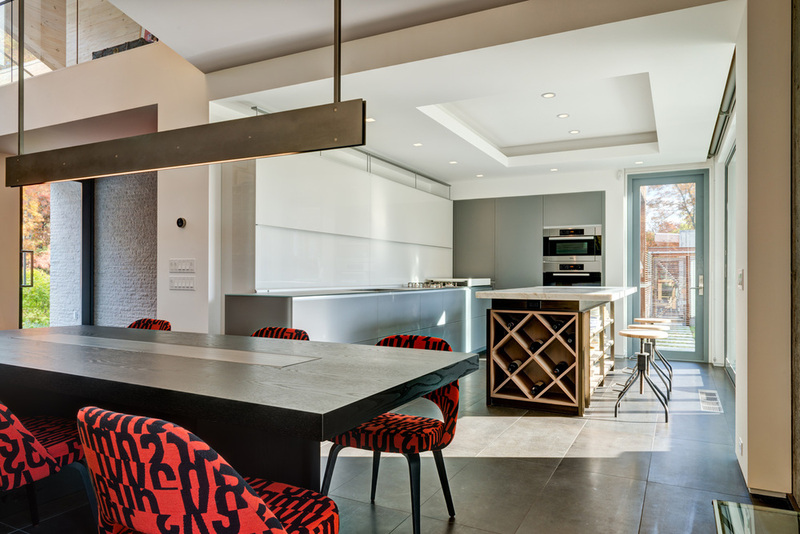 These elements, combined with the modern appliances and marble walls, create a unique contemporary kitchen, which serves this young modern family perfectly. 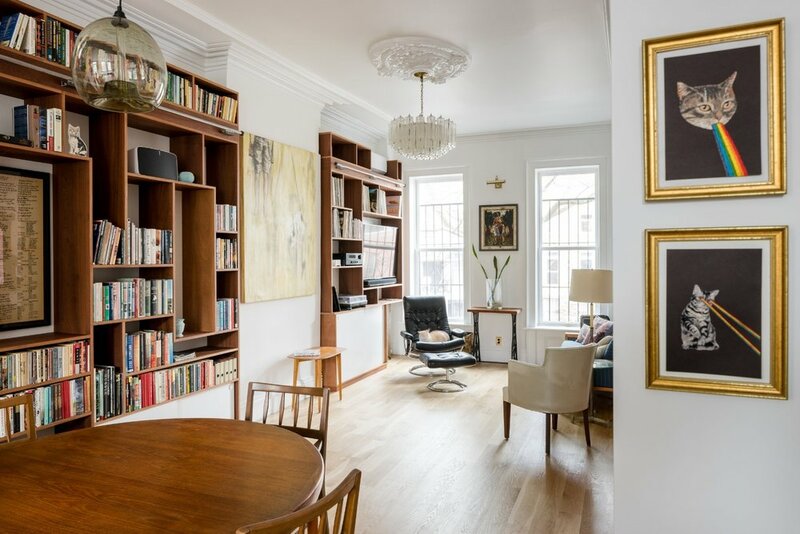 The lower two floors of this single family brownstone were fully renovated to create a separate ground floor apartment and parlor floor kitchen, dining, and living space. The original plaster moldings were restored and extended throughout the kitchen and stairwell. Interior paint, stone and finishes were chosen to recognize the original character of the building while reflecting the more modernist sensibilities of the client. 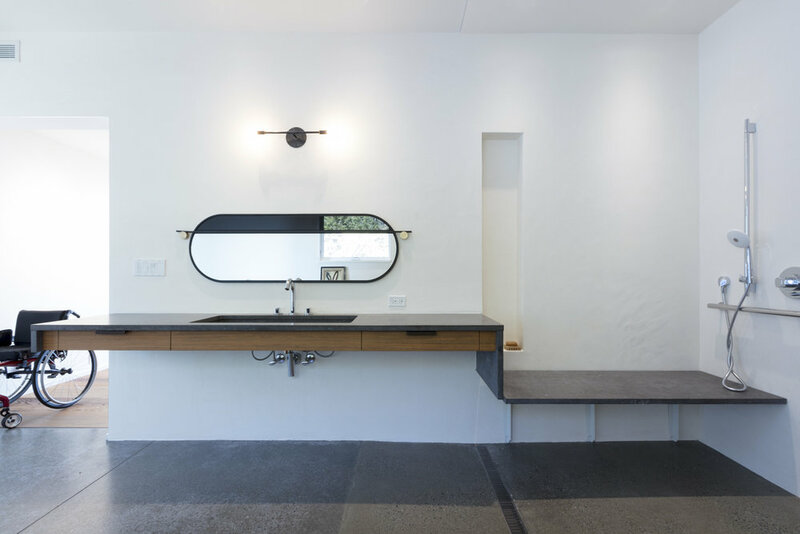 Rowan was responsive to this need for traditional, yet modern design when constructing the painted shaker style kitchen and the floating mahogany bathroom vanity.